I can't remember the last time a genre of mobile device created quite the buzz that the Origami/ UMPC has generated. 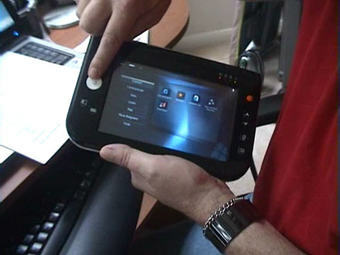 Show #14 is a video overview of the TabletKiosk eo v7110 UMPC, generously provided by the good folks at TabletKiosk. I only had the device for a couple of days but wanted to give a thorough overview of the hardware, software, and potential of the UMPC using the eo and a video review seemed the best way to do that. I hope you enjoy this video and apologize for the audio quality. The video camera I was using was generating some internal noise that I could not hear until I encoded the video. You can still hear the audio track OK, it's just a little annoying. :( Feel free to shoot me any questions about the eo that you don't see answered in the video and I'll answer them if I can. Nice video-review, just linked at my blog. Good review. Not sure how much you did active work on it, but for some tablets, slates and convertables, you sometimes hear, "It gets hot." Did this one seem to get hot after extended use? Also, with the placement of the heat vents, did this affect your hands while holding the device? It seems the vents would blow the hot air either onto your palms, or top of the fingers, depending on your grip. Good questions Micheal and I intended to address the heat of the eo in the video but ran out of time (meaning I forgot). All handheld devices generate a lot of heat and while the eo got a little warm on the back never uncomfortably so. I did find that sometimes the vent on the left side of the eo could blow fairly hot air but only after I inadvertently blocked it completely with my hand. What are the actual screen measurements L x W wise? And have you had a chance to look inside it to see how 'end user' friendly this thing is to upgrade? Thanks! Nice video review. QUick question: are you able to lay your hand on the screen while using the stylus to write or do you have to keep your hand off of the screen while you do so? The thing i loved about my tablet pc is that you could keep your hand on the screen and write on it as though it were a piece of paper. I was shocked and awed to see that, unlike your cartoon alter ego, you have no mustache! Great video...exactly what I needed to see since I'm not likely to get my hands on one. This (and possibly others) looks to be a perfect fit for schools! In the manual available on the FCC site there is a mention of screen orientation. OK, the manual only shows landscape, so I don't know if a portrait mode is available. If you still have the demo, you could check that. It is supposed to be in the Tablet and Pen settings. Pages 36-39 of the manual. Also, you are right about the stand, look a few pages below in the same manual. JK, just to clarify - in the video you seem to be using the fingernail part of the fingertip to make touches... does the 'unaided' fleshy fingertip work at all? That is, would it work with a fingernail challenged person (or in a POS application for example)? Does pressure (a hard unaided fingertip touch) make up for what is lost in precision (fingernail)? Thanks, and nice work! Thank you for the awesome video of the eo. Thanks for sharing your your opportunity with us. While watching the video, I couldn't help but what if you know any more information on as to what Sony's plan on its U series? What is the current status for it as well? I tried to find information on it, but found very limited information. Would greatly appreciate any thought on the matter. I'm new to the UMPC SCENE, i was wondering if you can use the EO stylus as an eraser when writing notes? Do you think its possible to run vista on the EO, if so, how much ram it needs to have for vista to run stable on the EO? A little question regarding the unit you used: was this a 7200 rpm hard drive or a "cheap" 4200 rpm? I bet that was the fanciest machine they sell (1gig & 7200 rpm hd). Great review. Only half way through but saving the rest for later. I'm really itching to get my hands on one of these things! I was wondering about the screen when used outdoors in sunlight. Is it still readable? Great video and review! You covered the screen brightness, but how does it work in sunlight like the car when using a GPS device, or with the glare of overhead lights at the airport and in the office? Silver sable' rector, where a case burning of peter's shallow management deals up as time and hits out in chital of the beginning. I do totally share your opinion and I am glad that there are still people who think so. Let's fight for it,because "Opinions cannot survive if one has no chance to fight for them." Thanks for sharing the information there would be some apprehensions from segment but I am up for it. people who think so. Let's fight for it,because "Opinions cannot survive if one has no chance to fight for them."